After super glue was found to be dangerous for use on people, medical companies rushed to find new types of super glue that would be safe to use on skin. The two main replacements were Dermabond by Ethicon and Vetbond by 3M. Other products have popped up to fill certain niches, including GLUture. What is Cyanoacrylate Skin Glue? Dermabond, Vetbond, and super glue are all part of a group called cyanoacrylates. These glues react with water to quickly form a durable, waterproof bond. Originally, industrial super glue was used to close wounds in the Vietnamese war, but it was never approved by the FDA for use on humans as it can cause skin irritation and skin necrosis. Dermabond was invented later and approved by the FDA for use on humans. Vetbond is made of a different cyanoacrylate surgical glue made for veterinary use that is also non-toxic but was never approved for use on humans. 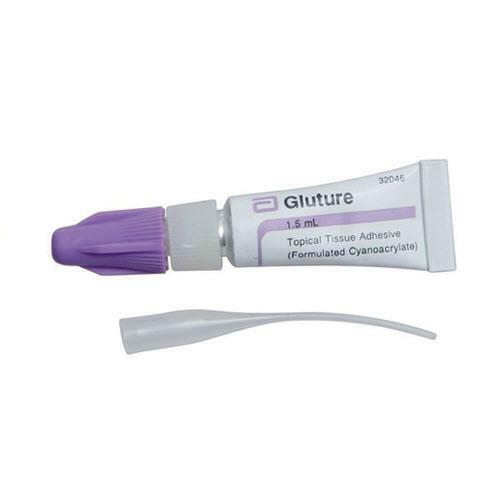 How is GLUture Different from Dermabond and Other Surgical Glues? GLUture takes a middle-of-the-road approach by combining 60% Dermabond with 40% Vetbond. By doing this, GLUture hopes to combine the strength and flexibility of Dermabond with the long shelf life and quick-drying properties of Vetbond. Unlike Dermabond, GLUture is not approved by the FDA for use on humans and is sold for animal use only. FDA approval is a long and arduous process that costs a lot of money and needs to address issues like sterility and cross contamination, that are mostly important in the world of hospitals. I personally have been using the non-FDA-approved Vetbond in my own first aid kit for the past 2 years on a number of cuts with excellent results. See my article on Vetbond for my own personal experience using surgical glue during an emergency situation. 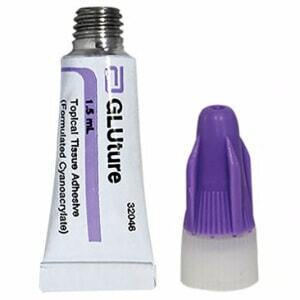 GLUture skin glue comes in an aluminum tube that is similar to industrial super glue packaging. It also comes with some plastic-tip, disposable applicators to avoid contamination via blood and body fluids. I personally have not found them to be useful as they can be messy, and it is just one more piece to keep track of. According to GLUture’s manufacturer, World Precision Instruments, GLUture has the same bond strength as 5-0 stitches, the equivalent strength of Dermabond. GLUture skin glue decreases the number of infections via an unstudied anti-microbial effect. The surgical glue naturally sloughs off in 5-7 days after application. Rubbing/washing the glued area will cause this to happen more quickly. As with Dermabond, Vetbond, and other cyanoacrylate surgical glues, GLUture is soluble in petroleum. Petroleum gels and liquids, such as triple antibiotic ointment, will dissolve the adhesive. SAFETY: Cyanoacrylates, including Vetbond, can cause powerful exothermic reactions when they mix with cotton, leather, or wool. When using the cyanoacrylates including Superglue, Vetbond, or Dermabond be careful not to let the glue come in contact with clothing made from this material. Remove the cap and use the pointed end to puncture the aluminum seal. Either attach one of the disposable applicators to the open end or use as is. Stop the bleeding by holding pressure with a clean cloth, bandage, or napkin. Slowly uncover one edge of the cut and quickly apply the skin glue. Try to line up the edges of the cut as naturally as possible to get a less visible scar. Here the blood may mix with the glue and harden in ugly clumps. This is fine as long as the bleeding stops. Once the edge of the cut is sealed, continue to slowly uncover the cut and seal it with glue until the entire cut is sealed and the bleeding has stopped. Do not apply triple antibiotic ointment or other petroleum-based products to the wound unless you are trying to remove the glue. GLUture and other skin glues work best on thin cuts with smooth edges. GLUture cures more quickly when it mixes with blood because cyanoacrylate surgical glues draw water from the surrounding environment when they harden. If you glue yourself to something by accident, soak the glued area in triple antibiotic ointment. Skin glue works great to seal cuts made when shaving. Use skin closure strips or tape to help take tension off the wound when the cut is on skin that is frequently under tension, such as the knee, elbow, or knuckle.